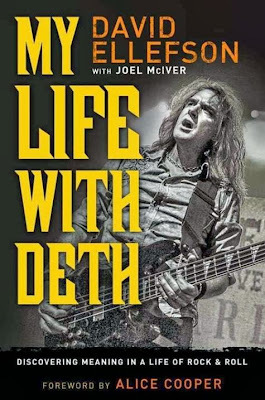 On October 29, Megadeth bassist David Ellefson will publish his autobiography, “My Life With Deth”, and he has announced a series of book signings to launch the project. “My Life With Deth” was written with Joel McIver, and features a foreword by Alice Cooper; it also includes contributions from Kerry King (Slayer), Scott Ian (Anthax), Ellefson's current bandmate in Megadeth, Shawn Drover, as well as former colleagues Chris Poland and Marty Friedman. On the road since the late spring release of their new album, “Super Collider”, Megadeth will team up with Black Sabbath for a tour of Latin America starting this Friday in Santiago, Chile. Megadeth will launch the Super Collider US tour November 23 in St. Paul, MN. For a list of tour dates, click here.